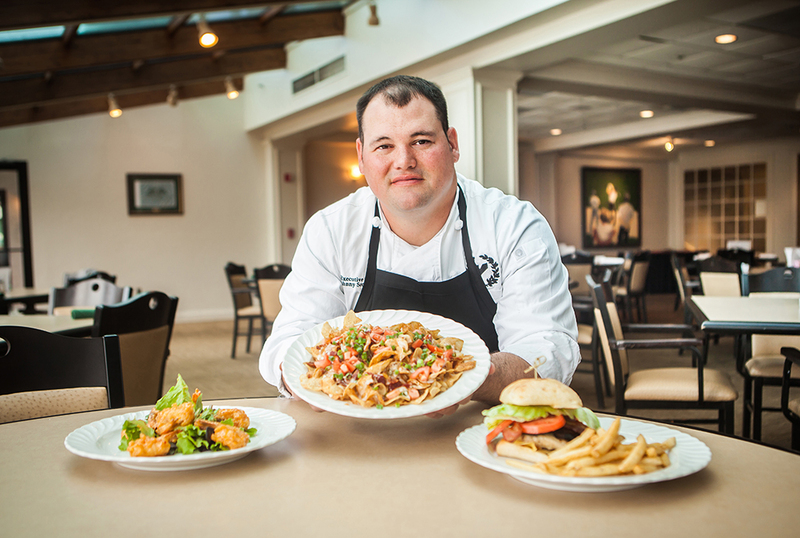 As the centerpiece for one of Alabama’s largest neighborhoods, the Riverchase Country Club (RCC) continues its pursuit to ‘raise the bar’ in the food and beverage areas of the club with original menu items crafted by new Executive Chef Jonathan Scoggins, aka “Chef Johnny”. Since his hire in October, Chef Johnny has been working hard with the staff to reach new heights to please the palates of both members and their guests. Chef Johnny grew up in Alabaster with parents who loved to cook, so when a severe knee injury ended his football career in high school, Scoggins changed gears and decided to attend Jefferson State Community College’s new Culinary & Hospitality Institute and become a chef. While at Jeff. State, he learned the magic and prestige that comes with working in a professional kitchen, which he now delivers at the RCC, using his French and Mediterranean expertise, as well as his personal precision and passion for new flavors. In the seven months that Chef Johnny has been at RCC, he has already introduced some of those new flavors. Working closely with the staff, he’s made a ton of improvements, creating a more upscale presentation with better quality foods. Some of these improvements can be seen with the launch of the newly designed Grill menu, introducing new dishes like his “Boom Boom Shrimp” and his signature shrimp and grits. [in the kitchen] are really good.” His goal is to make the food and beverage areas of the club more profitable so equipment and presentation can be upgraded even more within in the next year or so. In April, Chef Johnny plans to continue making changes, starting with revamping the menus again, including the Dining Room and Banquet selections, cross promoting different dishes throughout to increase variety and efficiency. If you haven’t eaten at the Riverchase Country Club, or it’s been awhile since you’ve gone, stop in sometime, whether you’re a member or a resident, and check out what the new Executive Chef has cooked up. I actually had the opportunity to try his “Smothered House-Cut Twisted Chips”, one of the new menu items from the Grill, and I have to say that this creative dish of homemade twisted potato chips, covered with bacon, cheese sauce, chopped tomatoes and green onions, may very well be my new addiction. They were incredibly good, in a portion sized to share. For more information on Chef Johnny, dining and banquets or residential privileges and membership at Riverchase Country Club, call 205-988-4140. Article and photo by Teth Lee. Teth Lee lives in Riverchase with her husband Casey, and their two children. She serves as admin for the Residents of Riverchase Facebook page and works as a freelance photographer.